The Kipawa River is a beautiful, fascinating, and pristine river that blends clear lake paddling with the thrill of white water ranging from CI to CIV. 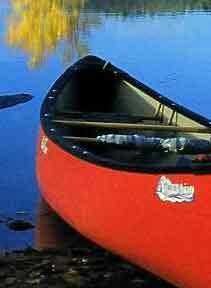 It has been a favourite of paddlers for many years; far less travelled than other areas. The Kipawa River can be as rough as you want or as soft as you would like. You can take the downstream leg of the Kipawa River for some prime rapids or a smoother route across Lac Watson, enjoying the mixed-wood forested banks. It is not uncommon to see moose, osprey, lynx, bear and deer. Your route can be planned to either descend the Dumoine River or stop off at one of our Dumoine Lake Cottages for a well-deserved rest. After a couple of days of fishing and relaxing a floatplane arrives to whisk you off to civilization. Your adventure begins at our base when your canoes are tied onto the floatplanes anticipating the flight to the ghost town of Hunters Point. Fly-in is also available from our Kipawa base, please call for more details. Scenery is diverse and marshes provide excellent bird and wildlife viewing opportunities on this route. The most part of the route is isolated but portages are easily located and not difficult. There are few campsites along the way, but some of the small cove beaches can be used as makeshift campsites. The Laurentian landscape surrounding the area also makes a great resting spot for lunch, a swim or overnight. Vehicles may be left at our air bases in Rapids des Joachims (Swisha) or Kipawa. Shuttle service is available from our base at Swisha, to your take out point at the mouth of the Dumoine at a cost of $50.00 per vehicle ; arrangements must to be made prior to your flight. Pick up service from your take out point at the mouth of Dumoine River to our base can be arranged. For those paddling back to the air base from the mouth of the Dumoine River, allow an extra day of travel to Rapids des Joachims. For decades the canoe camps from Lake Temagami would head their canoes east to the Ottawa, to gain access to the headwaters of the fabled Dumoine River, to run their cedar-canvas boats down the gnarly rapids with such provocative names as Big Steel and Canoe-eater. My first trip was in 1986. I paddled solo while two friends paddled their brand new cedar prospector. We flew in to Hunter's Point from the village of Kipawa and headed east to the Kipawa River. The Kipawa route is a bit of an oddity because you have to paddle both down the river on one section, crossover through the Ruisseau Bog, and then paddle up the Kipawa to gain access to Lac Dumoine and the Dumoine River. This two-week run is now a classic paddle and rated as one of the best trips in Canada. The Dumoine River is also rated very high on the roster of trips-to-do in paddling circles. The vertical drop of 500 feet over a distance of 70 kilometres is translated into some pretty radical descents. But even with that intimidating temperament, the Dumoine is a rather forgiving river. That's a good thing too because there are certainly a fair share of novice paddlers who regularly get dumped along the way.